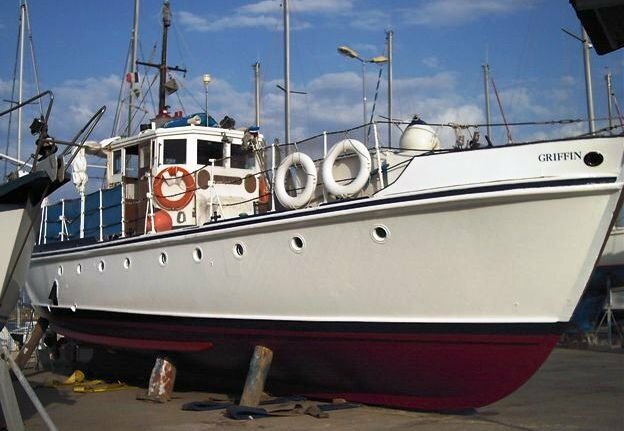 Builder: British Power Boat Co.
During the later part of the Second World War the Admiralty recognised the need for a series of robust general service launches for use by the Royal Army Service Corp. They were built by various well established UK boat-builders and of the twenty-nine constructed twenty-six are known to have survived a testament to their superb design and substantial scantlings. 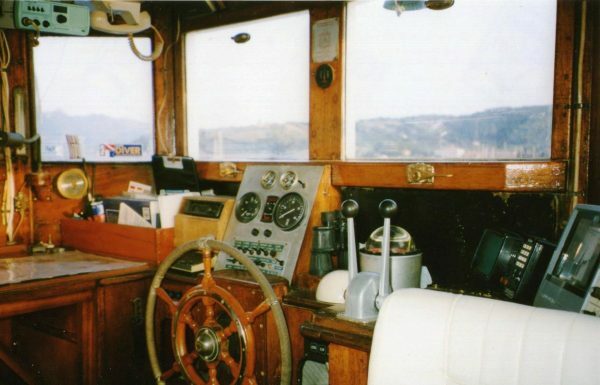 The original Series One Dickens Class featured a break deck aft, the Series Two vessels were a slightly modified flush deck design. 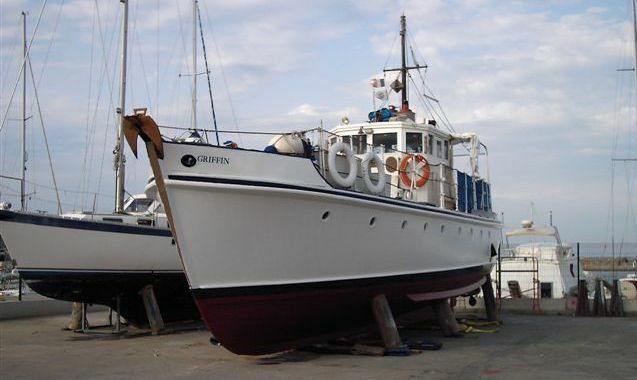 ‘Griffin ‘ original called ‘Linkinwater ‘ when in service like all of the GSL’s had names taken from Dickens novels. Tim Linkinwater being a character in Charles Dicken’s third novel Nicholas Nickleby. Most Dickens GSL’s were sold out of service soon after the war, they were ideally suited for conversion to spacious liveaboard / cruising motor-yachts without the need to alter the original structure. 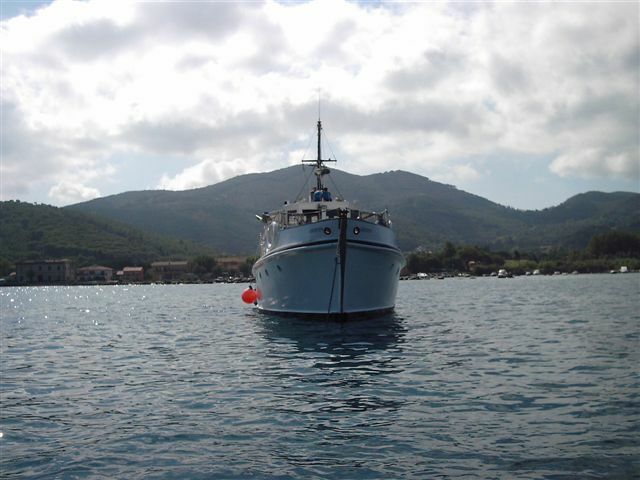 ‘Griffin ‘, a series two Dickens GSL is a particularly good example and has for many years been a comfortable family home in The Mediterranean whilst also being used as a dive boat business. 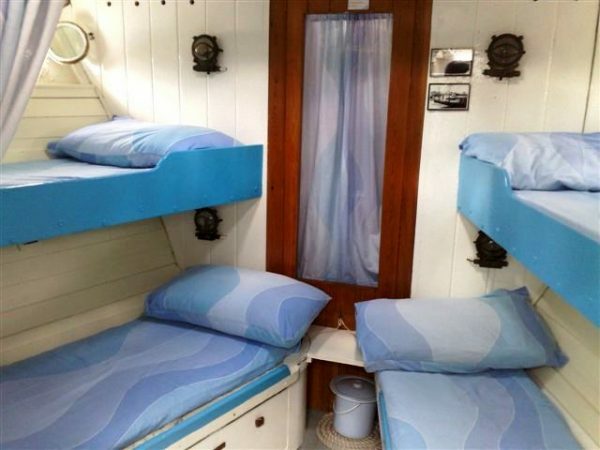 Currently the accommodation is laid out with eight berths which could easily be increased if required. 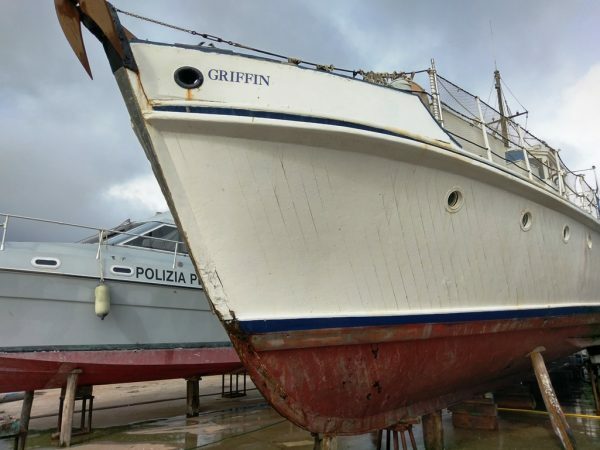 ‘Griffin ‘ has become a well known local attraction in her current marina port and as such was featured in a Barclay Card advertisement with Rowan Atkinson some years ago. 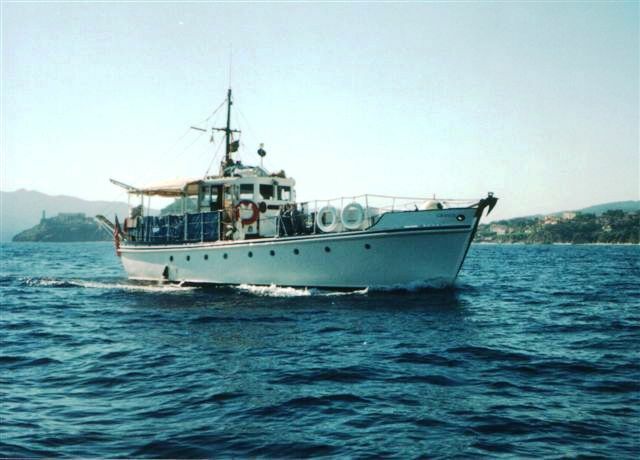 Paul McCartney once owned a Dickens GSL as a private yacht. 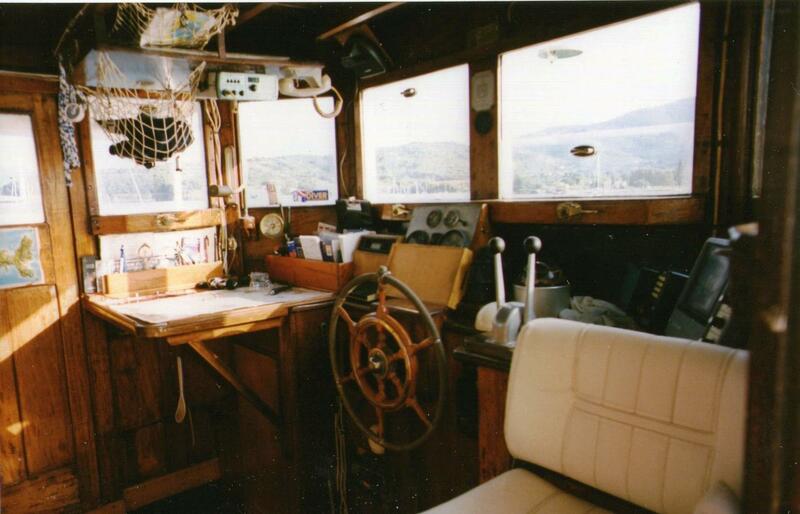 Double Honduras Mahogany hull on Oak frames with doubled water-line and belting. Heavy sheathed pine decks, painted hardwood superstructure. Long keel with bilge runners, hull all copper sheathed below the waterline. 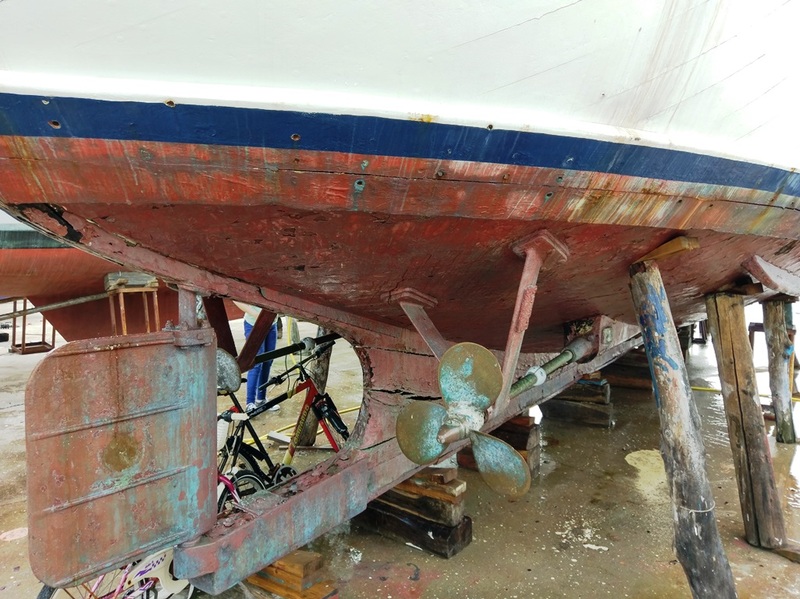 Cruiser stern, straight, raked stem, round bilges. Saloon with LCD TV and satellite TV equipment. 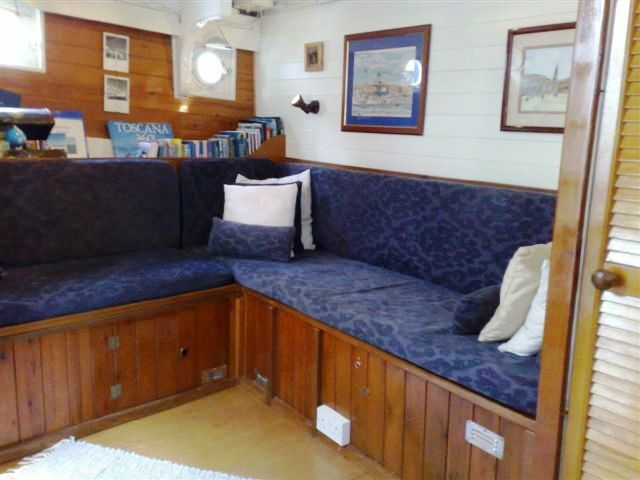 Settees convert to single berths. Bookshelves and storage. 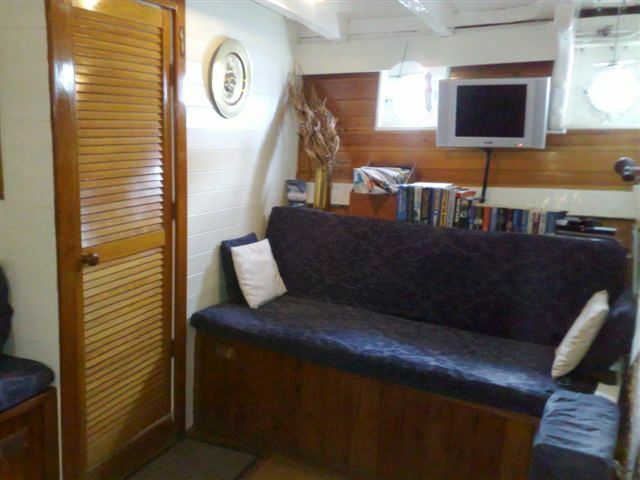 Large double berth aft cabin. 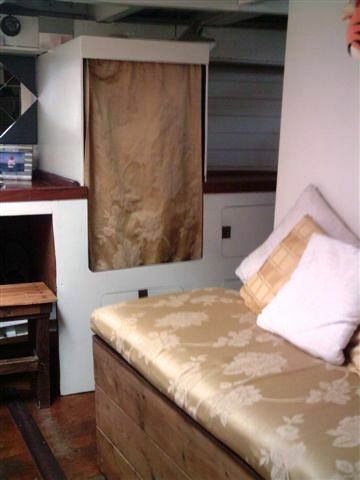 Vanity unit and day-sitting area, with extensive amount of storage and clothes-hanging. 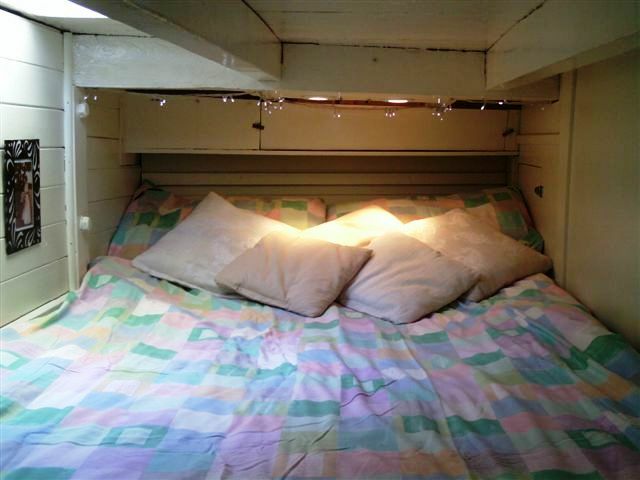 Small (removable) child’s berth. En-suite WC. Forward cabin with four berths, the lower two able to convert to a large double berth. 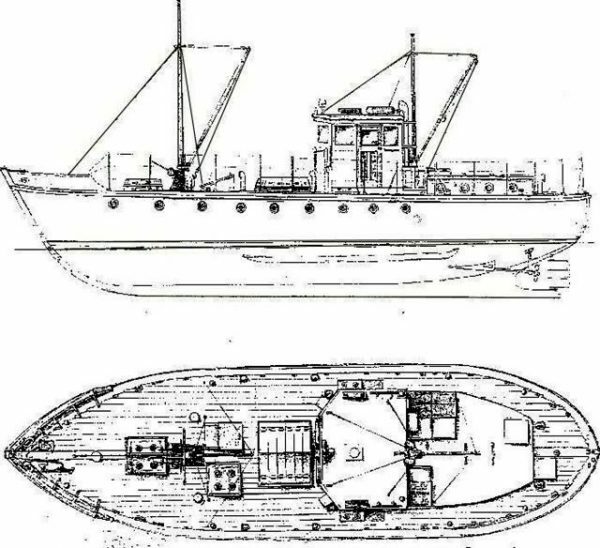 Aft cabin, engine room and saloon / forward cabin areas are all separated by full-height bulkheads. 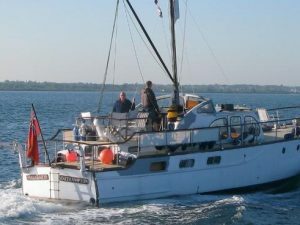 Lofrans 2000W anchor winch. Main 65kg Brittany anchor. 2nd 45kg Brittany anchor (brand new). 150m of 10mm chain. 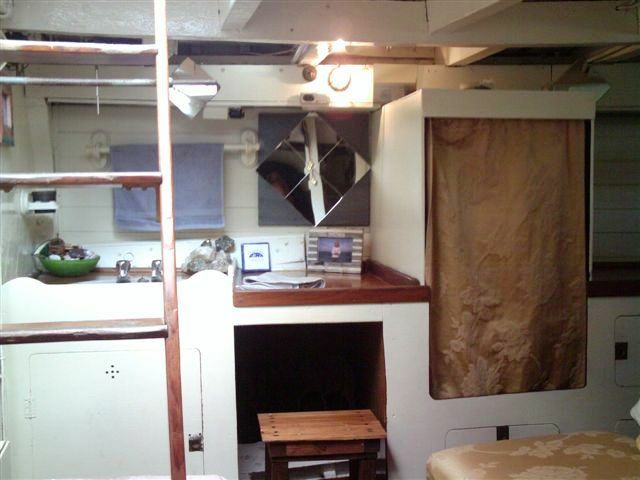 Well equipped galley, with generous storage. 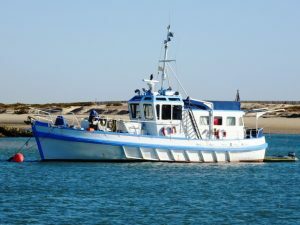 Fully-equipped dedicated engine-room / workshop, with vast amount of engine and on-board equipment spares. Twin 75hp Foden (Rolls-Royce) FD4 diesel engines, about 12-15 litres per hour consumption. 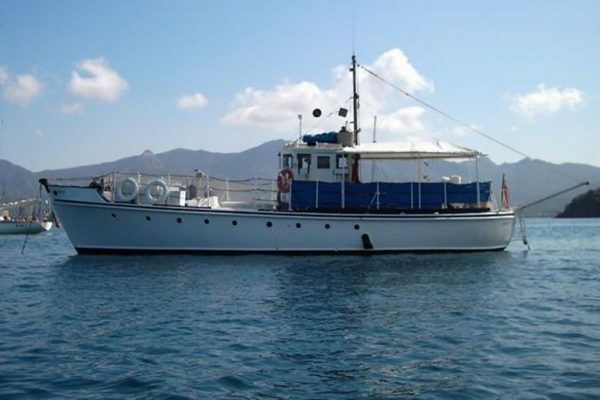 800 litres fuel capacity, 1200 litres fresh-water capacity and 200 litres holding tank capacity. Chargers, generator, inverter. 2 x portable backup generators. VHF, compass, GPS (x2), depth sounders (x2). Full set of charts, for local areas. 8-man liferaft. Full complement of brand-new lifejackets. 6 x 2-man DOT-approved lifebuoys. Floating MOB lights. Flares kit. Medical kits. Deck storage cabinets. The Dickens Class have a deservedly good reputation as extremely weatherly and capable vessels inspiring confidence in their sea-keeping qualities. 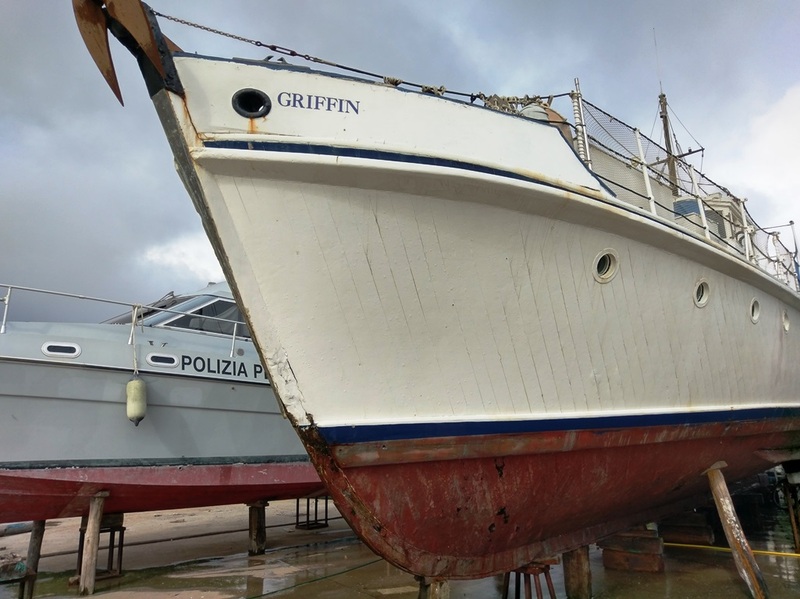 Their generous accommodation makes them ideal as liveaboard cruising homes as in fact ‘Griffin ‘ has been in the past in current twenty year ownership. Ideal for use as a working boat or as a ‘villa’ in the sun. 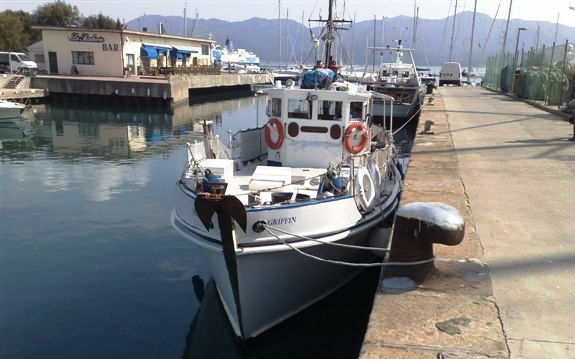 Laid-up ashore on the island of Elba, Italy and requiring re-commissioning having dried-out over the past few years. A very worthwhile prospect and seriously for sale, all offers considered. 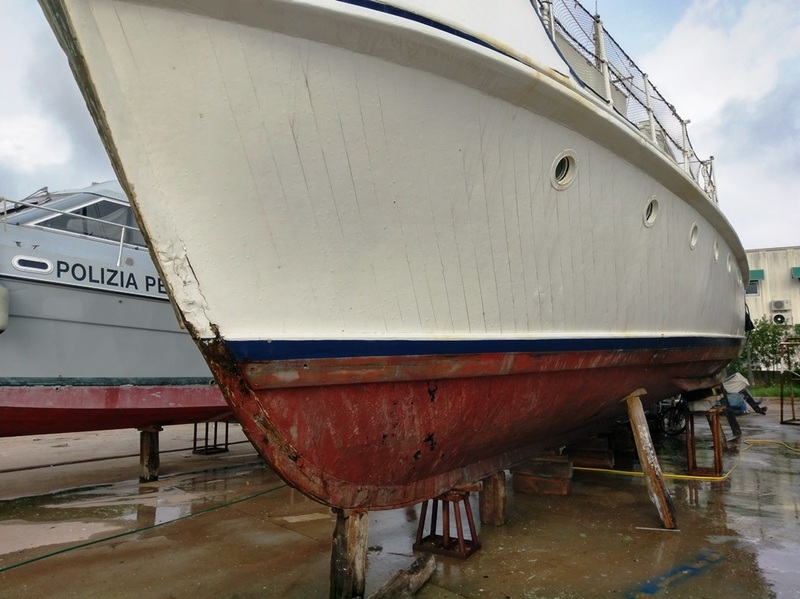 We haven’t lived aboard or worked the boat for the past 6 years and she has been little used since then. We visit as often as possible, to try and keep on top with cleaning, important maintenance, etc. 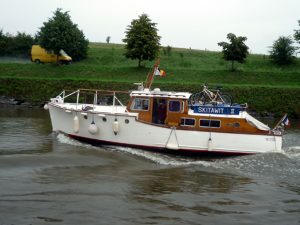 Due to the design and ventilation, she suffers very little with problems such as mildew, etc. 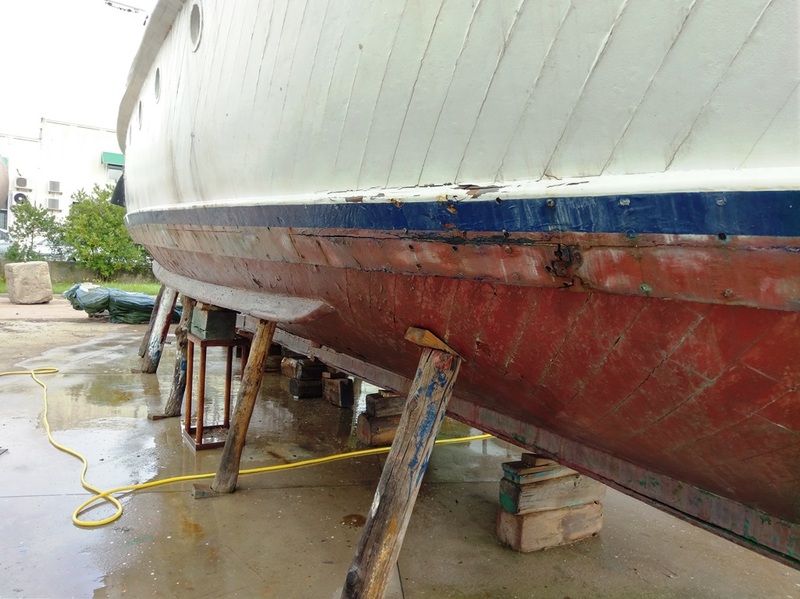 The hull was pressure washed at the last haul-out. 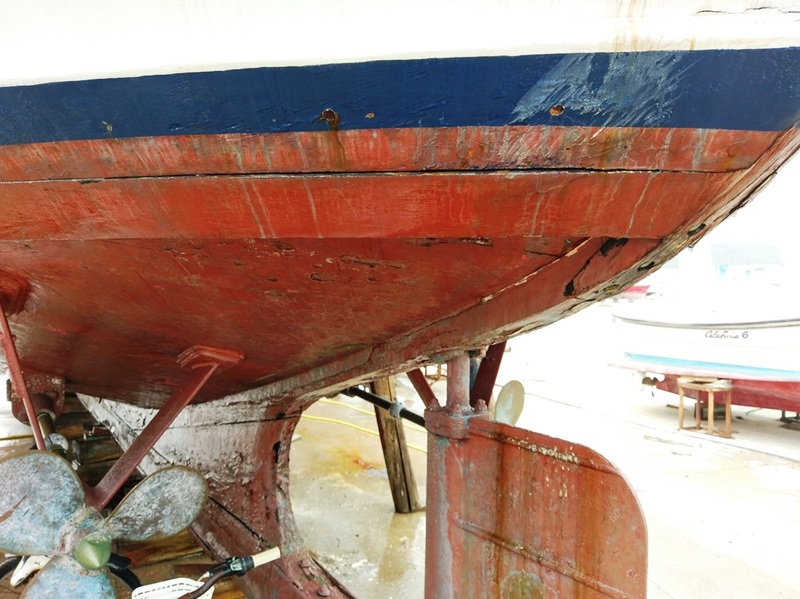 I would recommend that, as part of any pre-launch works, the hull below the waterline is taken back to bare wood. I would then re-caulk the garboard seam (the only major caulked seam on the boat, below the waterline) and any other areas deemed necessary, before priming and new antifouling. 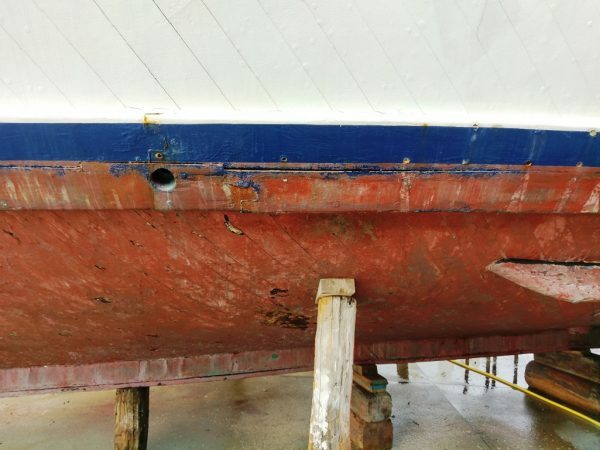 When last hauled, the hull, deck and topsides were immediately re-painted. However, these are now in need of some preparation and a re-paint. The mast will also need re-varnishing. 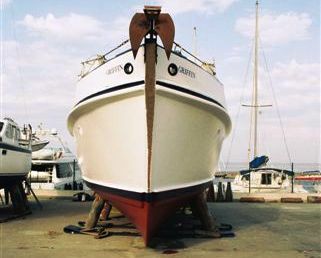 The stuffing boxes have been regularly maintained and greased. However, due to being on the hard, they may well have dried out and so I would recommend re-packing them, prior to any re-launch. 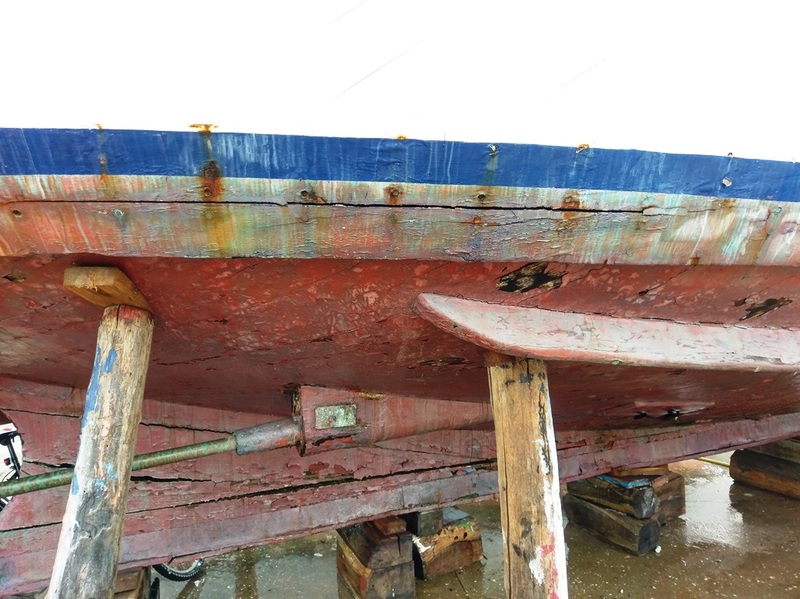 The rudder is also very stiff, but this is a very simple steel cable / pulley system, so it would just be a case of loosening, greasing and re-tightening. Overall, if it was myself preparing to put the boat back to sea, I would allow around a month for the preparation work. After the inital making of water, I am confident that she would take-up again very quickly.